I suppose this is only a funny tip on dealing with your microwave without losing your mind. A couple nights ago, I innocently pushed the 'Start' button as usual, when the screen suddenly said "Child." After staring at it dumbfounded for about a minute, hubby was called in to see if I might be mis-reading it. Nope, still said "Child." I took a photo, reset it again, and now it's back to only numbers. And no, before you ask, it does NOT say 'Potato' when I try to cook one. That's just disturbing! It's never shown letters of the alphabet before. Haven't a clue what it meant by that message, but I had the strangest feeling my over-used microwave just insulted me somehow. However, if it starts calling me 'Mom" I'm going back to using the stove. Editor's Note: We did a little research and it sounds like the child lock was accidentally activated. This is usually done by hitting the start button 3 or 4 times, depending on your model. I had never heard of this before, so out of curiosty, I pushed the start button on my micro-wave three times. Sure enough the display said "Child". I immediatly realized I didn't know how to "undo" what I had just done. After trying a couple of things, I pushed the stop/reset button three times and the display reverted back to the clock setting. I've never read my manual and didn't even know this "child safety" feature was on my micro-wave. I guess you're never to old to learn. OMG! That is hilarious to me, but sure you were spooked by it! Can't wait to share this with friends! Oh, that's a hoot! Thanks for the chuckle of the day! Obviously made for a 21st century Hansel & Gretel story. A bit creepy unless you know what it is! Years ago my Goddaughter, who was eleven at the time, was spending the summer with me. She kept burning food in the microwave early in the morning when I was still asleep. Not a fun way to wake up! Anyway, I set the child feature to keep her from doing this again. Wow. 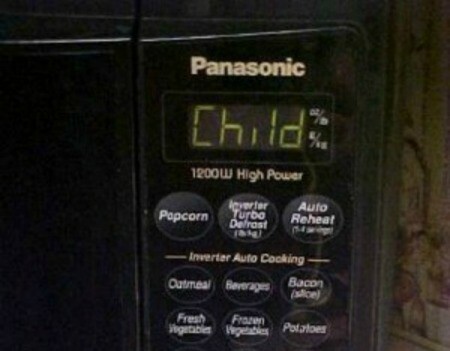 This is spooky, so this did not work on my microwave! This got to be a joke! rotfl! Thanks for the chuckle to end my week! Aldancer, I do promise it's not a joke :-) Ask family and friends to test their microwaves. Any microwave I've ever had has the feature so maybe you just have a really, really old one? This is the weirdest thing I have heard in a long time! I got a big kick out of it, thanks for posting you story! I guess I'm not the only one that gets my microwave into strange settings... Last month the darn thing somehow got put into the "Defrost" setting & we STILL haven't figured how to reset it! It still cooks, but takes twice as long! ...These things sometimes have a mind of their own. Speaking of "poltergeist's" They're here. Well I guess a lot of us learned something with your experience. I never knew there were child locks on a microwave. Yes, it is a child safety lock. With ours, we have to push "start" steadily for 5 seconds. With two small autistic kids, I know most safety features, such as locks and overrides on our electronics. Most newer things have locks or emergency shut off/ shut down features. Irons have a feature that will turn itself off if it falls or is lying flat for more than a few seconds. Stoves moved their dials to the top. Washers and dryers have lock features, too. Even trunks (boots) of automobiles have a latch that will glow in the dark and instantly release if pulled if a child (GOD FORBID) ever crawls inside. Every summer there is at least one death of a child like that. Check either your appliance handbooks or wander about in your newer appliance stores, you will see these features. That would scare the heck out of me! Makes sense after someone explained there was a child lock on it. Maybe someone can explain when my printer for my computer is shut off, on occasion it acts like it is in position to print, making the noise it does when you are going to print and then stops. first time it did this, it scared me. It has happened several times since. TY so much for this! I just put a plate of food in microwave and for some reason hit start and boom, I see "child" on the display. Pressing "start" made no sense. What I do is press "quick minute" 3-4 times and then hit start to get it going. Pressing the hold/clear button multiple times disabled the child lock that I seem to have activated. Pressing "start" multiple times did not work on my unit. I was about to reach around and unplug and see if that fixed the problem but this Thrifty Fun page saved the day. Thank you! We had this happen after I let my 9 year old use it...I was like hmmm. Was a little freaked out at first... Thinking damn this microwave is way smarter than I thought.